Attention: The launch date for Darsiders 3 is planned for 27-11-2018, although this date may be subject to change. Third installment of the Darksiders franchise, in which we will embody FURY in his quest to hunt and get rid of the Seven Deadly Sins. We will travel through an apocalyptic land with the mission of restoring balance. It is a hack-n-slash in which our magician must use his whip and magic to restore the balance between good and evil. One of the main characteristics of our new character is that he will be able to make use of his powerful skills in the magical arts to change his shape, each of which gives him access to new weapons, movements and devastating abilities. The world in which we will move is completely open and offers great freedom of movement, which we can explore and investigate as we advance through the main story and fight the legions of the Seven Deadly Sins and their servants. Let me make this point clear. If that’s what you are after, then this game is not for you. We need to keep in mind that this is developed by a new studio and cannot expect it to be like how the series was before. Sure it uses concepts of dark souls like serpent holes for saving/fast travel , dropping souls on death, but improvises it with its own system of combining concepts from Darksouls and Bayonetta . 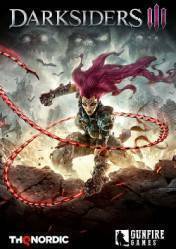 I would love to see "Darksiders III Deluxe Edition" on gocdkeys. I can find it by clicking on the 3rd party keyshops, but having it on gocdkeys will give me a much better overview.